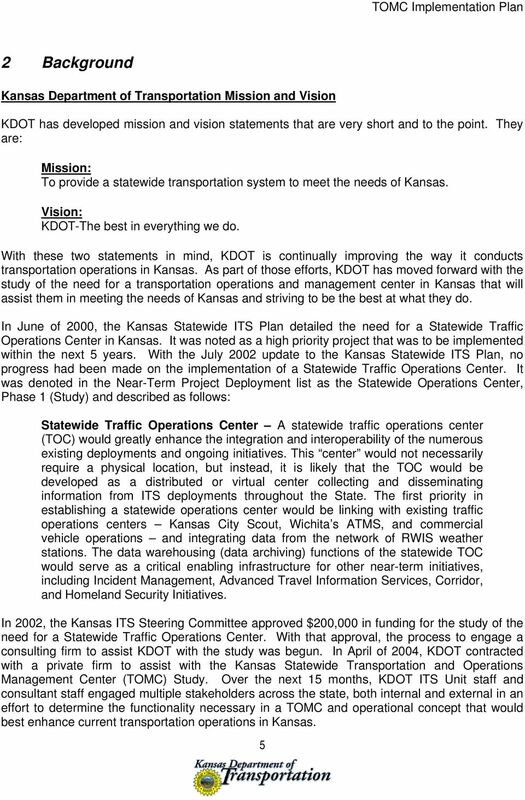 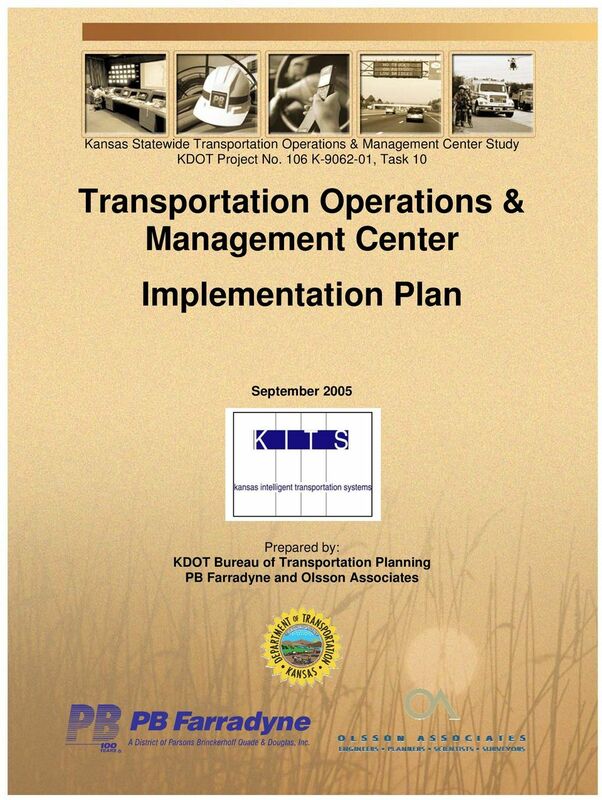 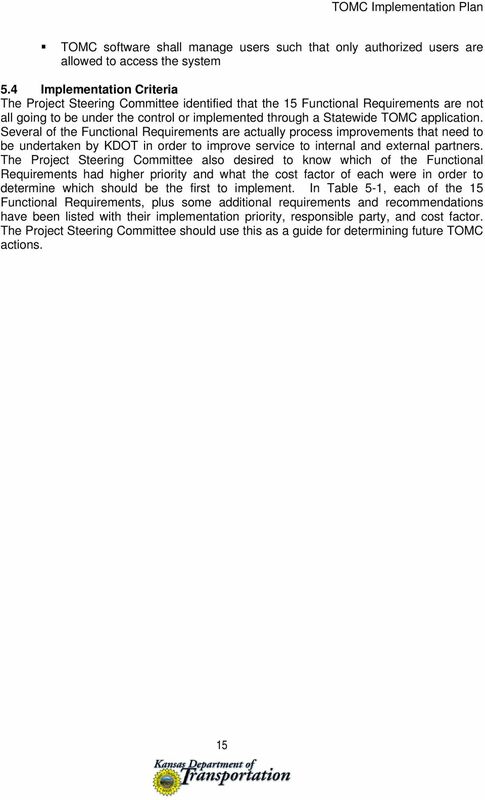 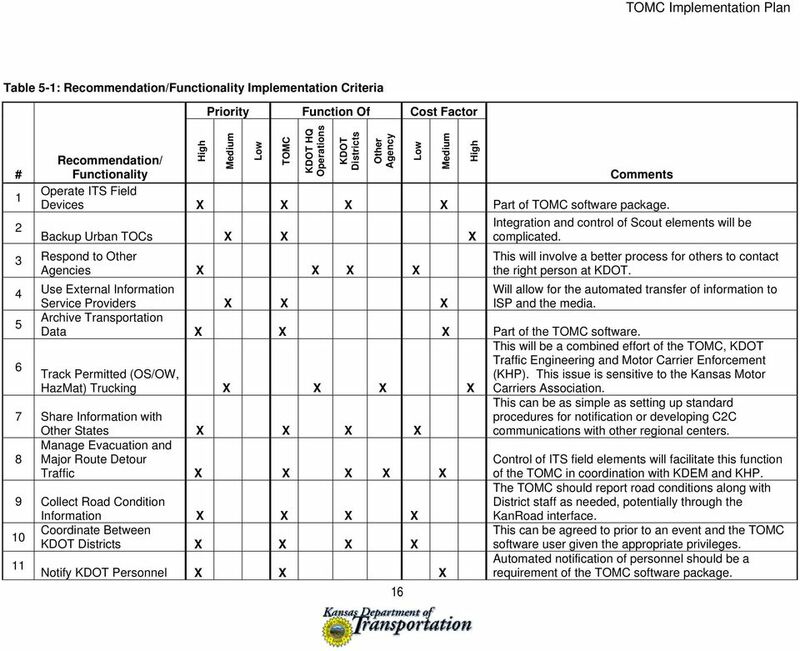 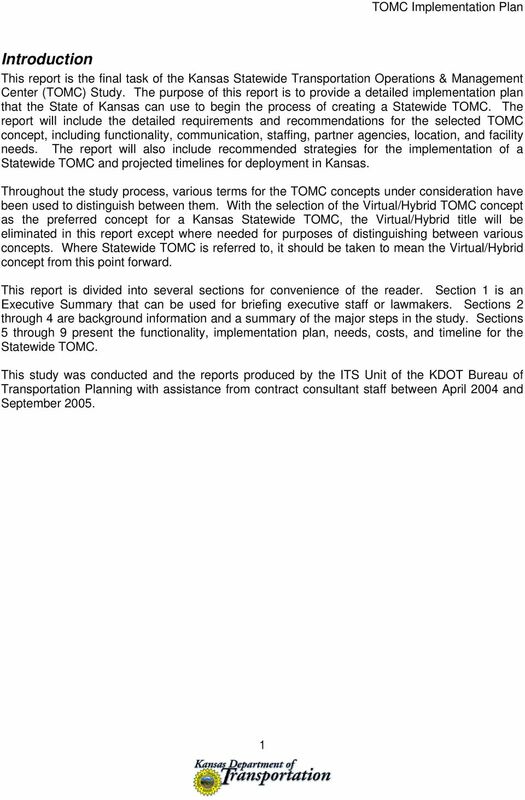 Download "Transportation Operations & Management Center Implementation Plan"
19 Table 5-1: Recommendation/Functionality Implementation Criteria # 1 High Priority Function Of Cost Factor Medium Low TOMC KDOT HQ Operations KDOT Districts Recommendation/ Functionality Comments Operate ITS Field Devices X X X X Part of TOMC software package. 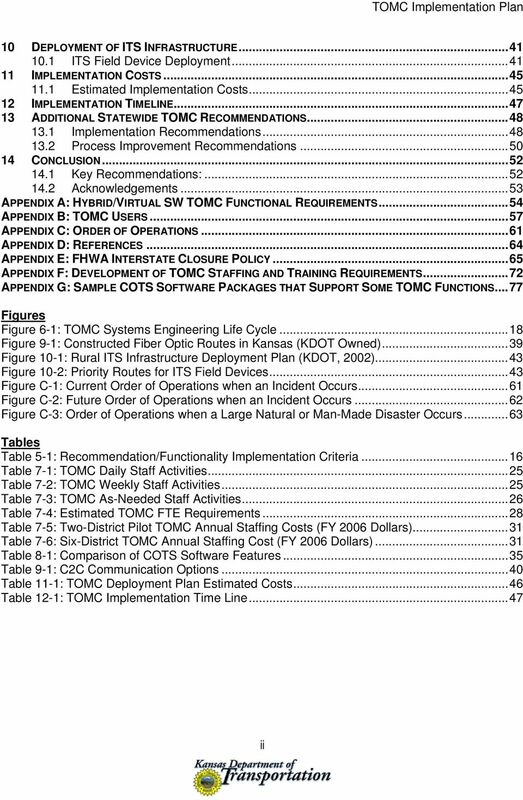 2 Backup Urban TOCs X X X 3 Respond to Other Agencies X X X X 4 Use External Information Service Providers X X X Archive Transportation 5 Data X X X Part of the TOMC software. 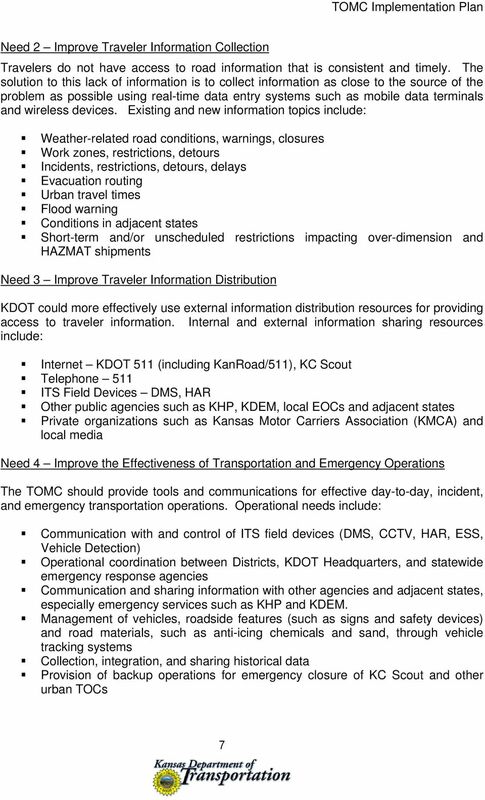 6 Other Agency Track Permitted (OS/OW, HazMat) Trucking X X X X 7 Share Information with Other States X X X X Manage Evacuation and 8 Major Route Detour Traffic X X X X X 9 Collect Road Condition Information X X X X Coordinate Between 10 KDOT Districts X X X X 11 Notify KDOT Personnel X X X 16 Low Medium High Integration and control of Scout elements will be complicated. 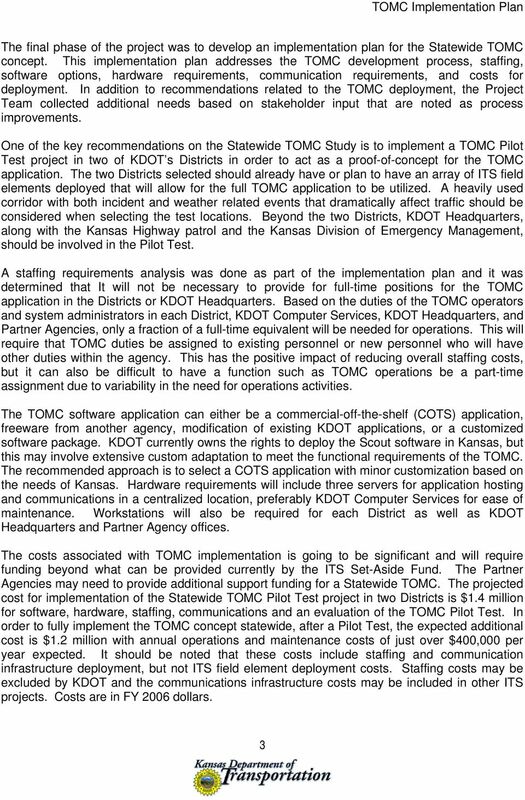 This will involve a better process for others to contact the right person at KDOT. 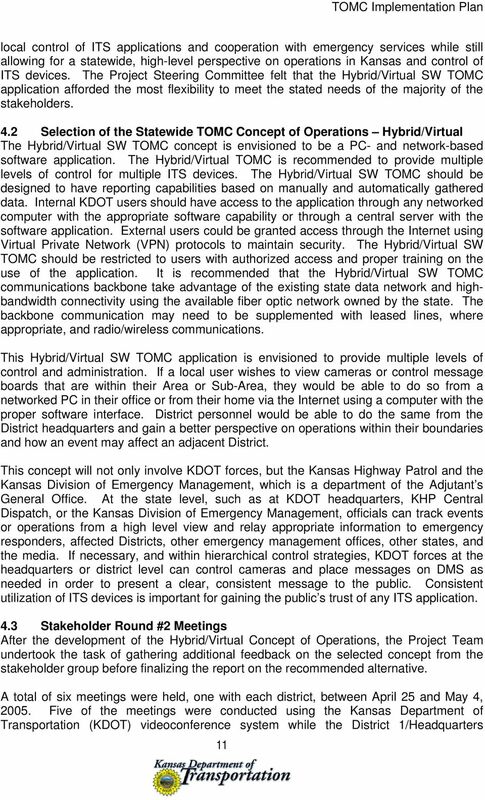 Will allow for the automated transfer of information to ISP and the media. 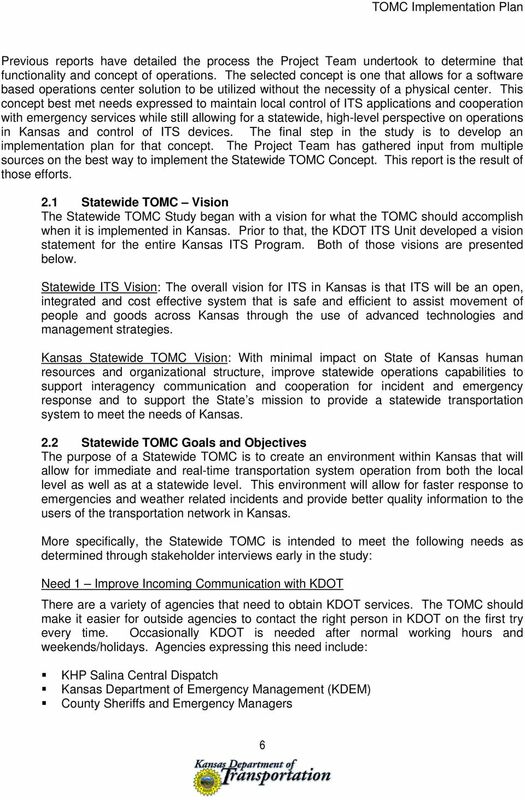 This will be a combined effort of the TOMC, KDOT Traffic Engineering and Motor Carrier Enforcement (KHP). 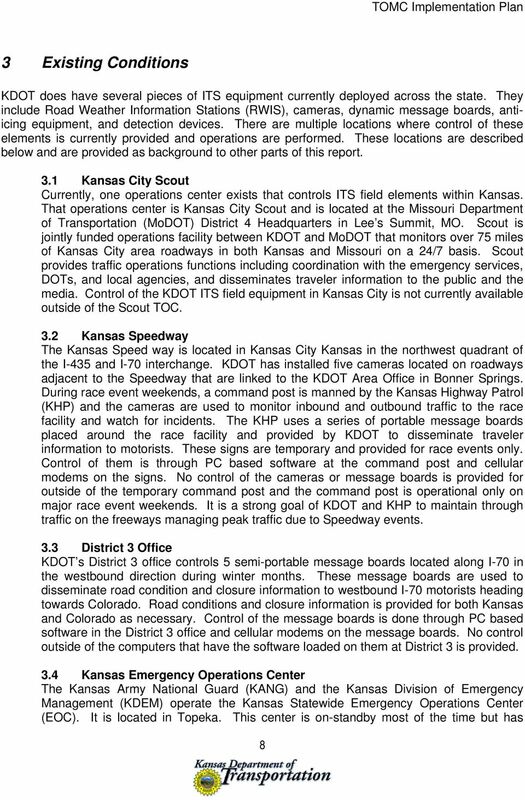 This issue is sensitive to the Kansas Motor Carriers Association. 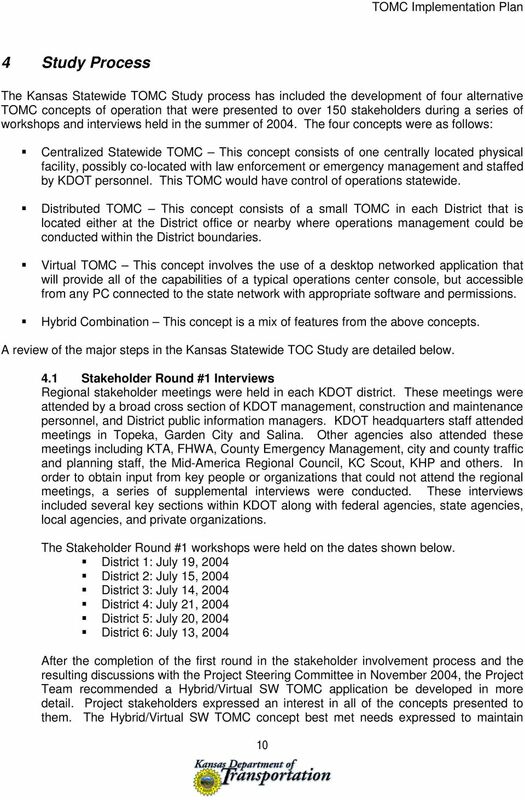 This can be as simple as setting up standard procedures for notification or developing C2C communications with other regional centers. 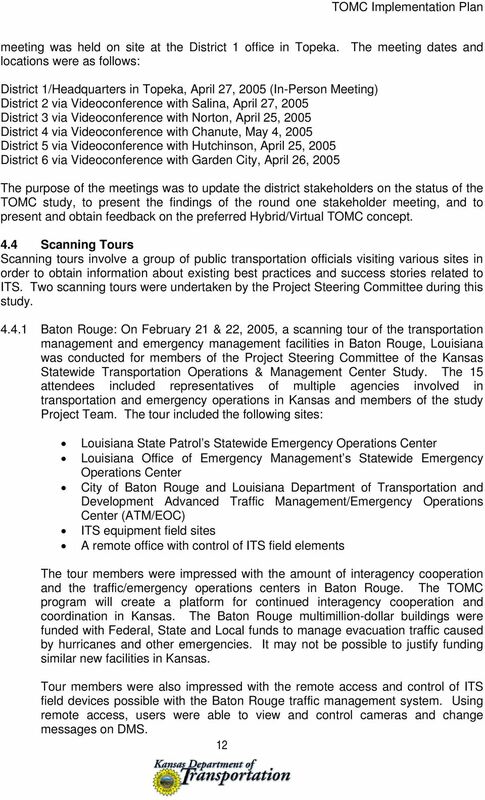 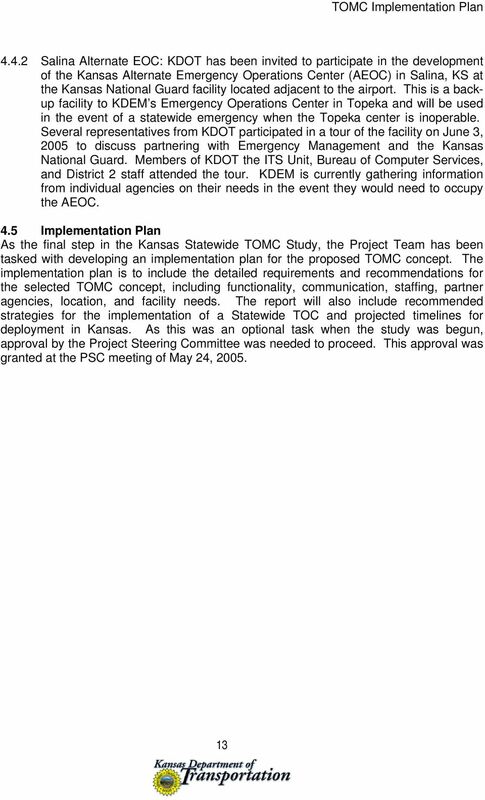 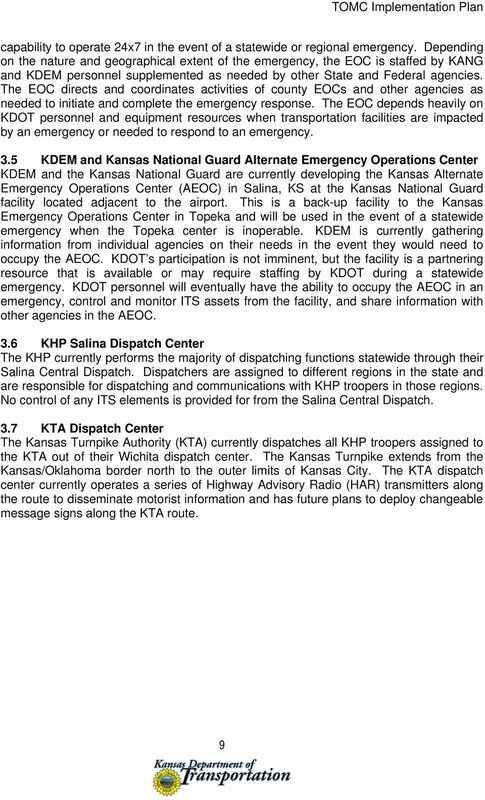 Control of ITS field elements will facilitate this function of the TOMC in coordination with KDEM and KHP. 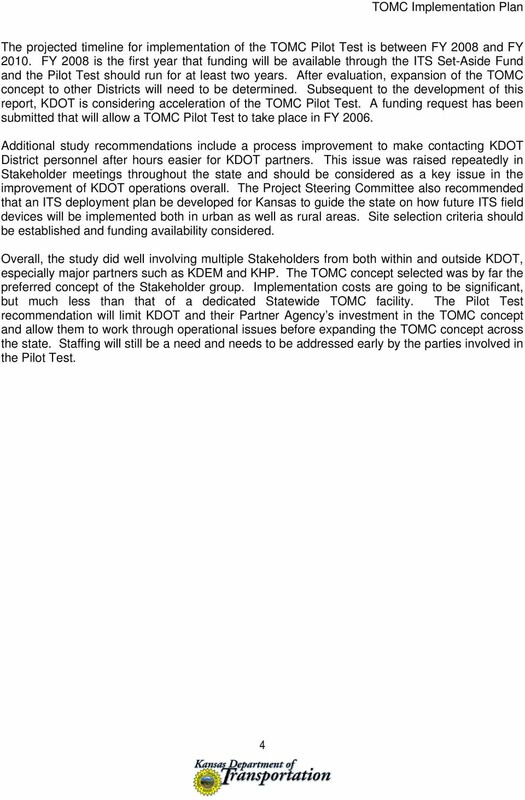 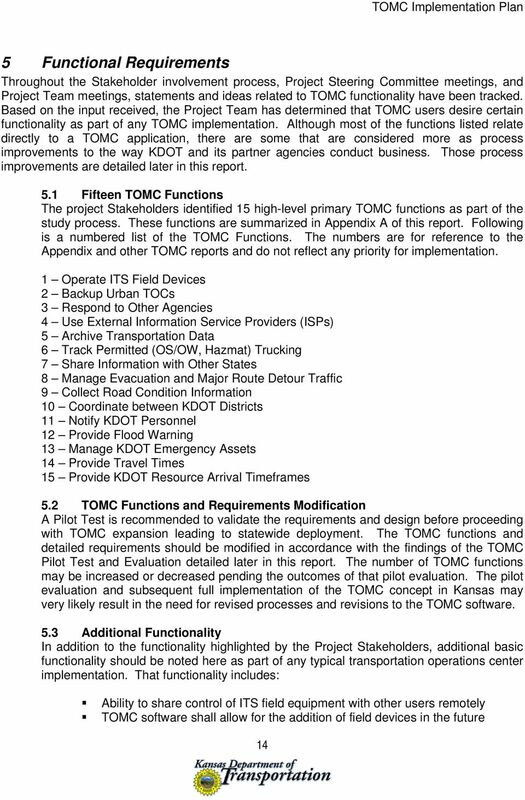 The TOMC should report road conditions along with District staff as needed, potentially through the KanRoad interface. 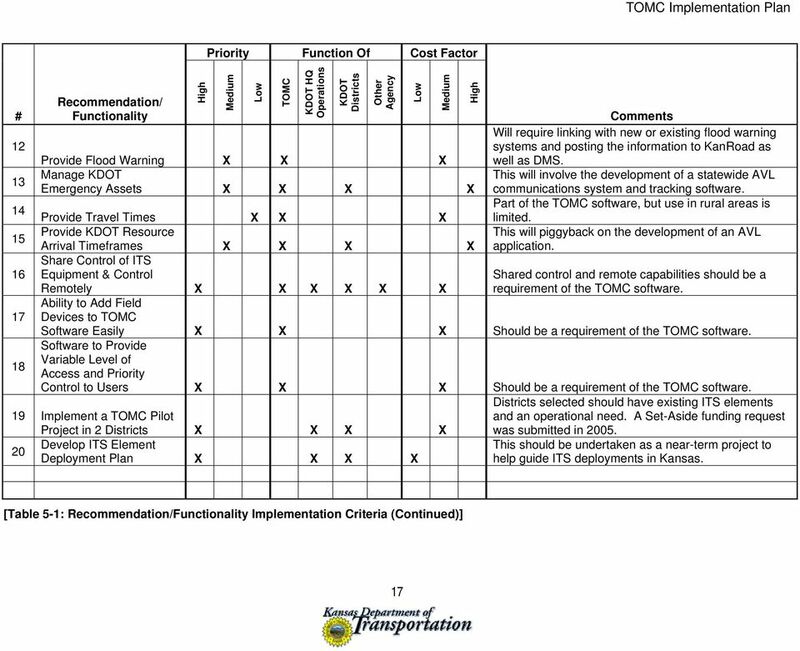 This can be agreed to prior to an event and the TOMC software user given the appropriate privileges. 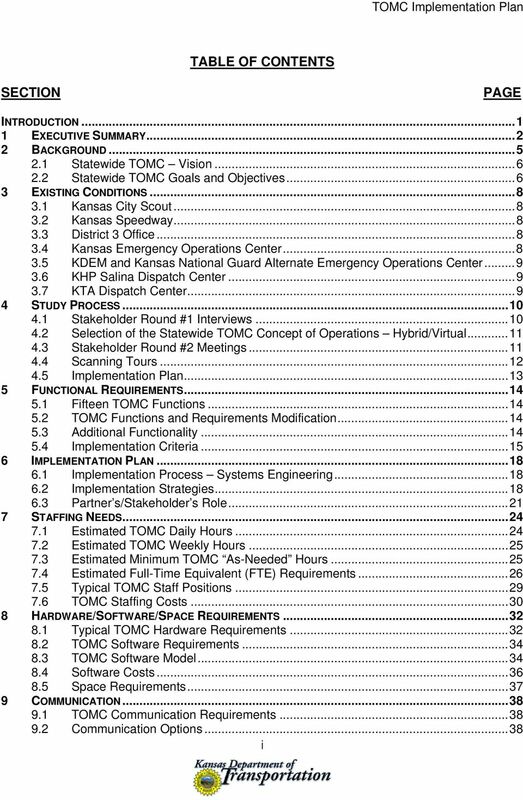 Automated notification of personnel should be a requirement of the TOMC software package. 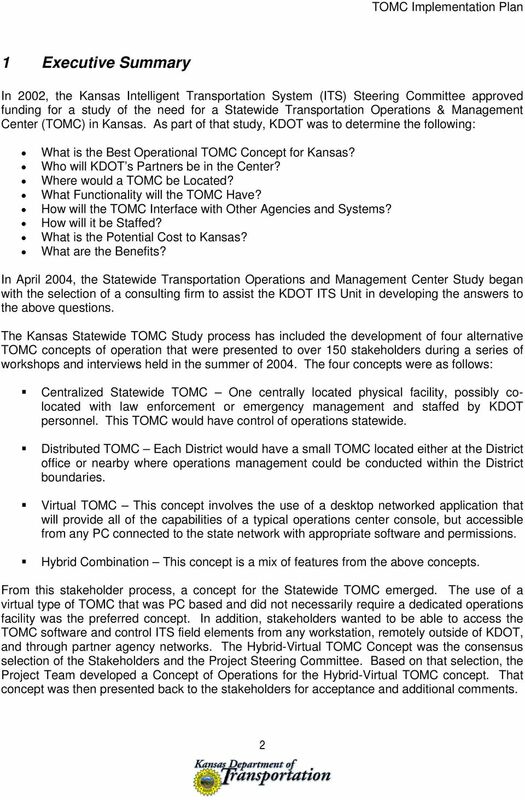 Section 4: 4.0 Introduction Objective The objective of the is to develop implementation strategies and near-, medium- and long-term deployment plans for ITS in Kansas with a focus on rural applications.